The 50-by-80-foot strip of land sat neglected until the La Loma Grace Brethren Church, Modesto, Calif., took a leap of faith and planted it with a community garden. “It was an eyesore with people in the community, and people are ecstatic that someone is putting it to good use,” says Pastor Joel Richards. 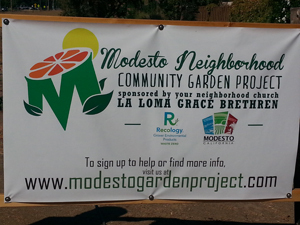 The Modesto Neighborhood Community Garden Project is located on the north side of Modesto, about a mile from the church, and is situated on city-owned property. The idea for a garden was born as outreach teams at the church brainstormed ideas for the coming year. Team leaders had talked to a neighbor who expressed that a community garden would be a beneficial addition to the neighborhood. The church decided to explore the possibility, and, literally, dug in. They planted traditional crops: corn, squash, watermelon, cantaloupe, okra, eggplant, and peppers. “Everything that was grown was given away to whoever wanted it,” says the pastor. “The neighbors have said they’ve seen more families on the walking path that runs behind the garden,” he added.